After the MDB file is completely scanned , the contents of all the tables can be previewed along with its associated attributes. The tool allows to resolve all types of corruption issues that occur in a MDB file due to virus attack , trojan infection,sudden system shutdown. The tool can restore the Queries , tables , forms , macros and other data present in the MDB file. 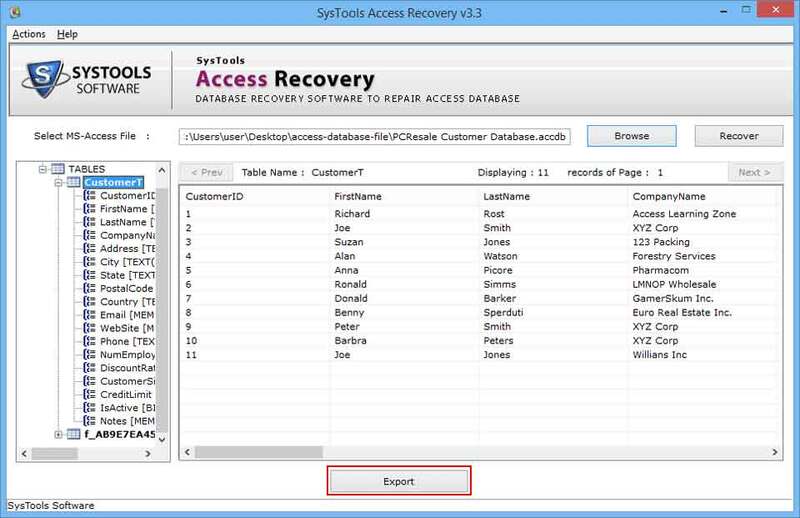 The tool scans and restore the Microsoft Access database file. You can select the tables that you want to export from the MDB file using the MS Access Repair tool. The recovered data can be saved either in the form of the MS Access Database or as a CSV File. 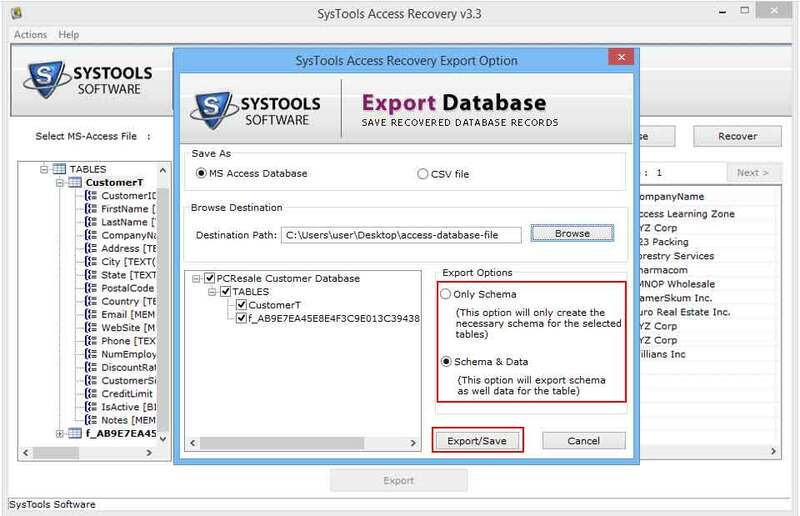 With Access Recovery tool, fix corrupt Access database to recover Access contents in original form as the software does not hamper any data information in any way. Facing any corruption issue in your Microsoft Access database .MDB files? Are the MDB file contents (tables, queries, relationships, etc.) inaccessible to you due to database damage? 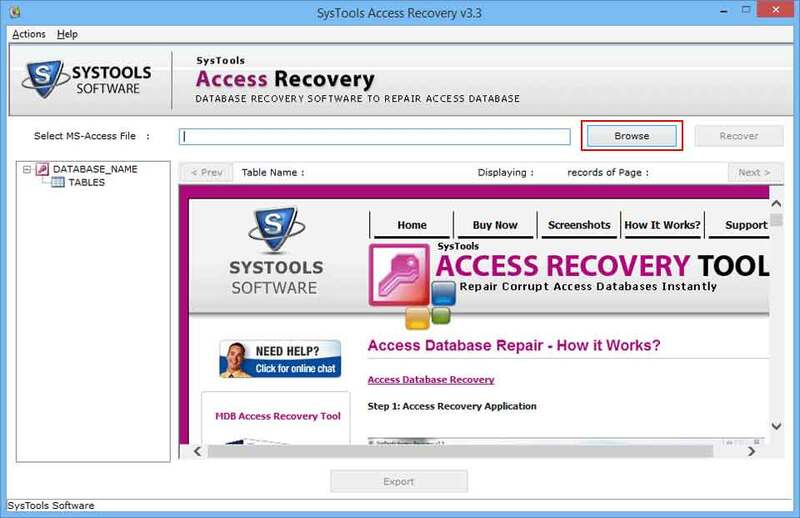 Then, you need to Fix Access database using an Access database recovery tool that will open Access and then repair corrupt Access files to help you recover Access database contents. 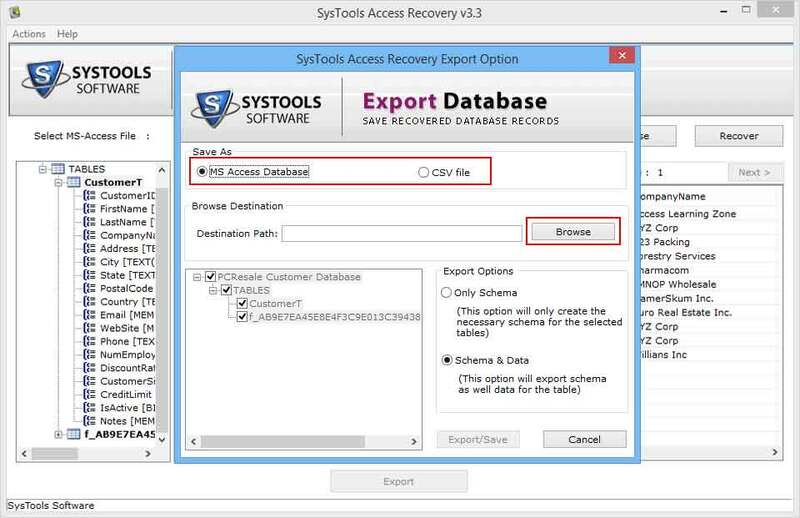 Here is a tool that does not hamper your crucial data information saved in Access database MDB files in any way - Access Recovery Tool. It does not delete any data information while recovery. It does not over write any data while performing MDB recovery. It does not damage any information contained in Access database. It does not change any data information while the recovery process. Step 1: Initial Screen of Access Recovery. Step 2: Preview Access File contents and click Export to proceed. Step 3:Select Destination File Format. 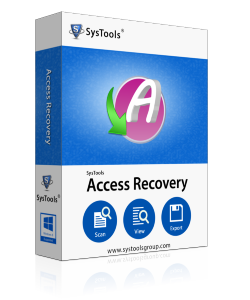 Can I recover my deleted records from access files with the help of your tool? Yes, the MS Access database repair software scan corrupted Access Databases and recovers deleted records too. Can I add multiple MDB files for recovery? No , only one MDB or ACCDB file at a time can be recovered using the tool. Is MS Access installation required? Yes, to save the recovered database there is need to install MS Access. 4. Is their any limitation imposed on the product to restrict the size of MDB file? No, there is no file size restriction on the software. You can recover MDB file of any size without any limitation. I was able to quickly recover my important database from the corrupted MDB file using this tool. It was a nice experience to work with this repairing tool. Thanks a lot. I was able to restore my deleted Access Database using the tool in a very less time. The performance and speed of the tool are really appreciable.